If your facility does not necessarily require a 6-log (99.9999%) sterilization level decontamination, ClorDiSys offers alternative options to our chlorine dioxide gas services including chlorine dioxide fogging. The term fogging is the method of decontamination when a liquid is applied in a mist onto a room’s surfaces. Compared to gaseous chlorine dioxide, which spreads throughout an entire facility and penetrates into the smallest cracks, fogging has some limitations. 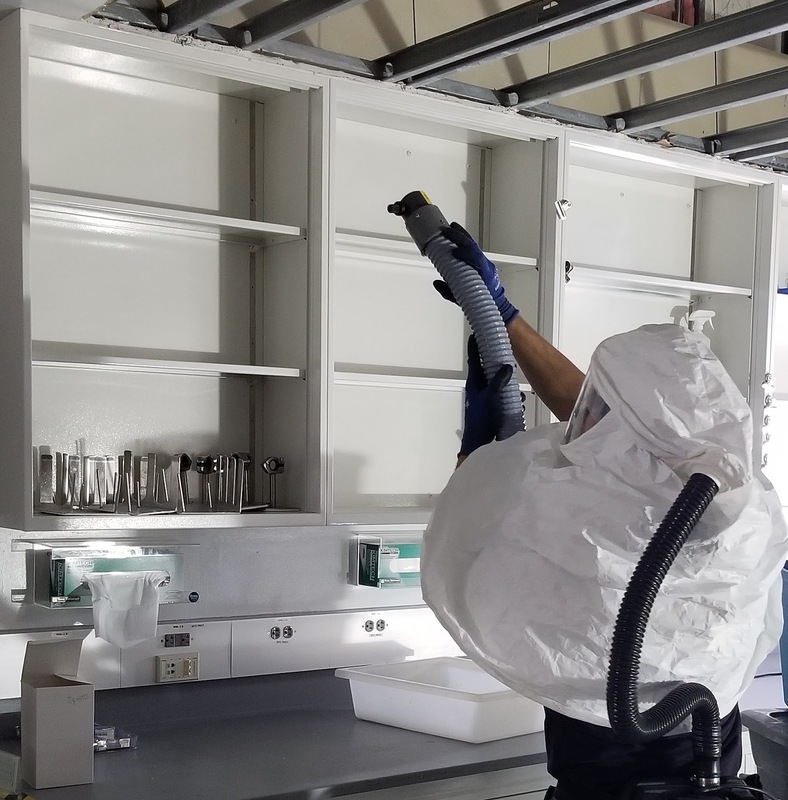 Liquid fogging has many factors that reduce the ability of this agent to reach all the required areas for the required amount of time in order to achieve a successful decontamination cycle. Liquids have difficulty penetrating into crevices as they cannot overcome the surface tension. When providing disinfection fogging services, ClorDiSys sprays surfaces with liquid chlorine dioxide applied at concentrations capable of eliminating viruses, bacteria, fungi and spores. Handheld foggers are used such that a trained technician is able to reach more surfaces than a stationary fogger by opening drawers, cabinets and enclosures, as well as changing the angle of application in order to minimize shadow areas which are not being contacted. During application, PPE such as a full-face respirator or PAPR is required for all people in the room. Safe concentrations should be verified prior to re-entry without PPE. In most cases, only minutes are required to get below 0.1 ppm prior to re-entry. Fogging with a liquid chlorine dioxide provides a more economical disinfection method compared to gaseous decontamination, offering a value proposition for less critical contamination control applications. Interested in learning more about fogging with liquid chlorine dioxide? Email us with any questions or potential projects. This step includes checking to see if any pipes, electrical conduit, conveyors, ductwork, or other items go through the wall/floor/ceiling. Sometimes these penetrations are sealed, using caulk, gaskets or other means. When they are not sealed and there is a gap for air to travel into/out of the space, additional sealing is necessary in order to contain the decontaminating agent. If permanent sealing is appropriate, the gaps can be caulked in place. 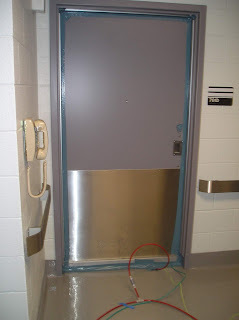 For circumstances where permanent sealing is not allowed, duct tape is the primary sealing tool. In order to provide the decontaminating agent the contact time necessary to achieve the level of kill desired, the space must be isolated from an active HVAC. Depending upon how the HVAC system interacts with the space and surrounding areas, the supply and exhaust can either be sealed off at the room level or at the roof level. Finally, once the penetrations are sealed and the space is isolated from the HVAC, the doors are all that is left to be sealed. 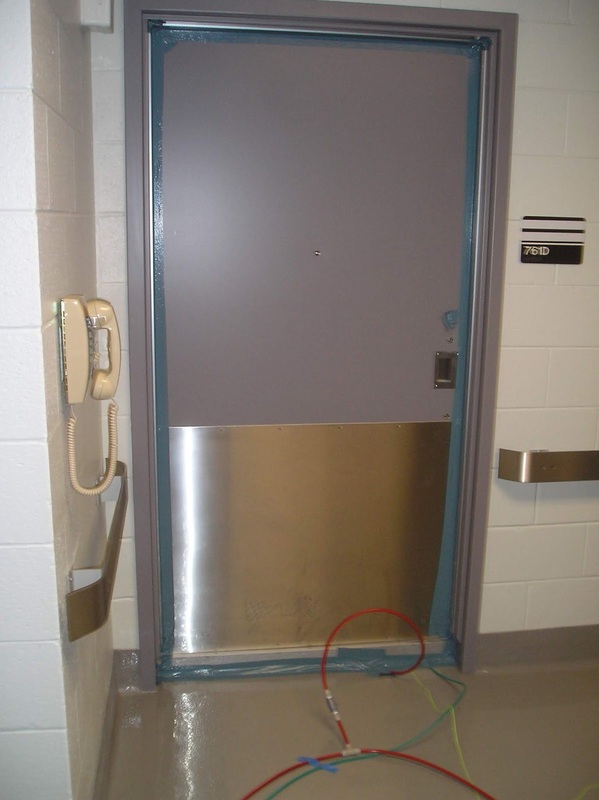 Once again, simply using duct tape to seal around the door is sufficient to properly seal off the area being decontaminated. Healthcare-associated infections (HAIs) can happen in any health care facility, including hospitals, ambulatory surgical centers, and long-term care facilities. HAIs have increased 36% over the past two decades. Patients come in contact with many items and surfaces within a hospital. Surfaces such as walls, curtains, remotes, clothing, and handrails are all potential transfer sites of infection. 41% of patient rooms had at least one surface contaminated with MRSA and/or C. difficile.1 The air is another carrier for harmful organisms, leaving the setting as a whole to be potentially very dangerous. ClorDiSys is proud to offer a complete line of ultraviolet light disinfection products and services to enhance your healthcare facility’s infection prevention program. In the waiting rooms, operating rooms, and patient rooms, the Torch Aire-Recessed allows for continuous disinfection of the flow of air by simply replacing a ceiling tile. The Torch Aire-Recessed can disinfect all the air in a 2,100 ft3 room once every ten minutes. Any air flowing through is being treated by the concealed UV-C bulbs that kill any pathogen that enter. The device is quiet, effective, and since the bulbs are hidden from view, can operate even in the presence of patients and staff. Room surfaces can be disinfected by a variety of UV disinfection systems, including the Torch and Torch+. The Torch is an inexpensive, easily transportable, powerful disinfection system used to provide a rapid and highly effective method to disinfect surfaces and common touch points to reduce the transfer of dangerous organisms. Each Torch tower produces an efficient UV-C output of 12 mJ/minute (200 μw/cm2) to get a calculated 99% reduction of MRSA in 1 minute and Clostridium difficile spores in 5 minutes. The Torch system is designed to be so economical that multiple units are affordable enough to place into a room at the same time to eliminate shadow areas and maximize coverage. For areas needing special attention, the Torch-Flex and Torch Double-Flex are capable of applying UV disinfection within tight spaces and focused areas. If a permanent option is desired, the Flashbar can be installed in the room to provide an even simpler UV system for routine disinfection. By adjusting the quantity and placement of Flashbar units in a room, decontamination can match workflow patterns involved in the facility’s layout. Make sure your patients leave healthy and stay healthy. Learn more on April 16 at our Ultraviolet Light 101 webinar or visit Booth #1848 at next week’s AORN Global Surgical Conference & Expo. 1. Faires et al. The Identification and Epidemiology of Methicillin-resistant Staphylococcus aureus and Clostridium difficile in Patient Rooms and the Ward Environment. BMC Infectious Diseases 2013.